Watching Sean Hannity on Fox, I’m sure not feeling much excitement about Romney’s performance. He spent five minutes talking to Sarah Palin, and they spent most of the time expressing disappointment about what Romney didn’t say. “He just didn’t have time to make all the points he needed to,” Palin sighed. In the end, they used nearly the entire segment imagining the attacks Romney should have made, rather than defending what he did say. I’m not surprised, since Romney went out of his way to be as un-Foxlike as possible on the warmongering front. Well, Governor, we also have fewer horses and bayonets, because the nature of our military’s changed. We have these things called aircraft carriers, where planes land on them. We have these ships that go underwater, nuclear submarines. And so the question is not a game of Battleship, where we’re counting ships. It’s what are our capabilities. Not only is this a good line, but it made Romney look naive and childish, dishing out puerile talking points without really understanding what they mean. The CBS snap poll of uncommitted voters gave the debate to Obama, 53%-23%. CNN’s poll of all debate viewers (which tilts Republican) showed Obama winning 48%-40%. PPP’s poll of swing state voters had Obama winning 53%-42%. For my money, Obama’s best moment came after Romney hauled out his “apology tour” trope. The transcript doesn’t do it justice. On paper it sounds good, but his delivery made it great. He sounded just a smidge outraged by the whole thing, which was exactly the right tone. On MSNBC, Steve Schmidt says he thinks Romney passed the “commander-in-chief test.” I’m not so sure about that. I don’t think this debate hurt him badly, but I sure don’t think he looked especially ready to take over America’s foreign policy. Mark Kleiman: “Obama landed some heavy blows, while Romney maundered; in a sane world, Obama would count as the clear winner. In the actual world, more or less a draw. Romney’s capacity not to notice when he’s had a hole blown in him is astounding.” I suspect that’s a little too pessimistic. 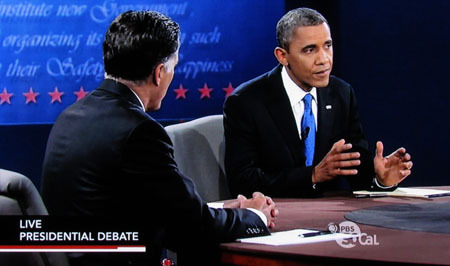 I think most viewers probably noticed Romney’s inability to articulate any real policy differences with Obama. Hilarious line of the night comes from Sean Hannity: “Marines still use bayonets, so maybe somebody should educate the president about how the military works.” Seriously? Apparently so. Later on Hannity was crowing about the Marines using horses in Afghanistan too. This just reeks of desperation. Republicans are spinning hard to make this sound like an Obama debacle, but if you read between the lines, conservative reaction to the debate hasn’t been very positive. Romney decided — probably with good reason — that he needed to be extremely restrained tonight, and this meant that he barely mentioned any of the Republican pet rocks that keep the base so riled up. No Churchill bust. No failure to meet with Netanyahu. No attacks over Benghazi. Only a bare mention of the Muslim Brotherhood taking power in Egypt. This has left conservatives mostly mooning about what Romney should have said and relitigating Benghazi all over again. They think Obama has proven himself the weakest world leader since Neville Chamberlain, and they just don’t understand why Romney didn’t mop up the floor with him. The conventional wisdom, such as it is, is that Romney took this tack because he needs to build support among women, and bellicosity doesn’t play well with that demographic. Maybe so. We’ll see if that works out for him. But it sure has left a long trail of despondent conservatives behind him.